And so the festive season begins! It's been some years since I've had an advent calendar. I suppose that's fine, and I don't really want to buy myself one as it's not really the same. I've found my Christmas spirit in projects like Journal Your Christmas, in school carol concerts, in London shrouded in lights, and brilliant evenings with lovely friends. 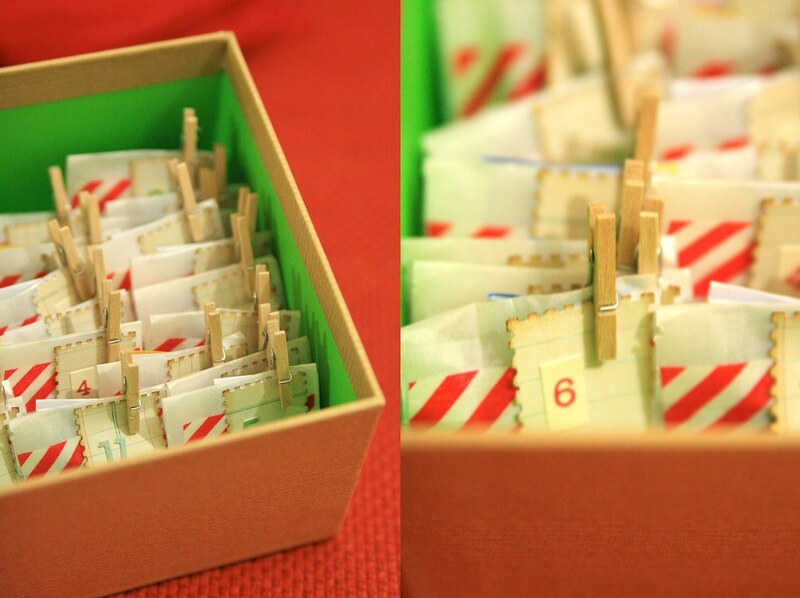 This year I decided I would bring back the advent calendar, and so I determined to make one for the man. (I'm pretty sure he doesn't read this, so there won't be any spoilers. But if by some chance he does, he should stop now to avoid spoilers. Hint hint) I thoroughly enjoyed making this project, it was easily completed in an hour or two, very inexpensive, and I will definitely be repeating this festive craft in years to come, as I found it a lovely way to prepare for the approaching season. 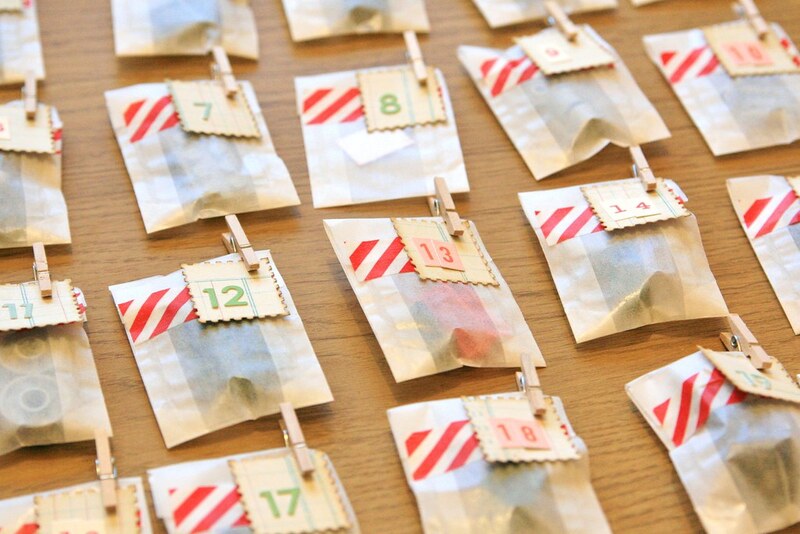 So here is my little Boxed Advent Calendar tutorial. Depending on your views, you may have a variety of different expectations for what an advent calendar reveals each day. For me, it was a verse from the bible telling the Christmas story, building each day until the Baby Jesus arrived. In later years, this was accompanied by a packet of sweeties that I could sample, one each day as I uncovered the next line of the Christmas story. For others, advent calendars will mean chocolates, Christmas characters, sweets... all manner of things. For the man, I decided it could only be one thing: Lego. Whatever the theme of your calendar, you're going to need a little something for each day. It might be something tangible, such as a tasty treat, or a handful of toy bricks, or it could be some heartfelt words, pictures. I went with Lego as I thought it would be fun, with a little bit more to build each day, and the inherent guessing game as the model gets larger. I chose the kit, and split the pieces into 24 little piles, and the instructions fit nicely into 24 steps. Actually on one or two days, the instructions get you to stick two different sections of Lego together, so no bricks were needed. For those days, I substituted a little beer token which he can exchange for a pint down the pub. 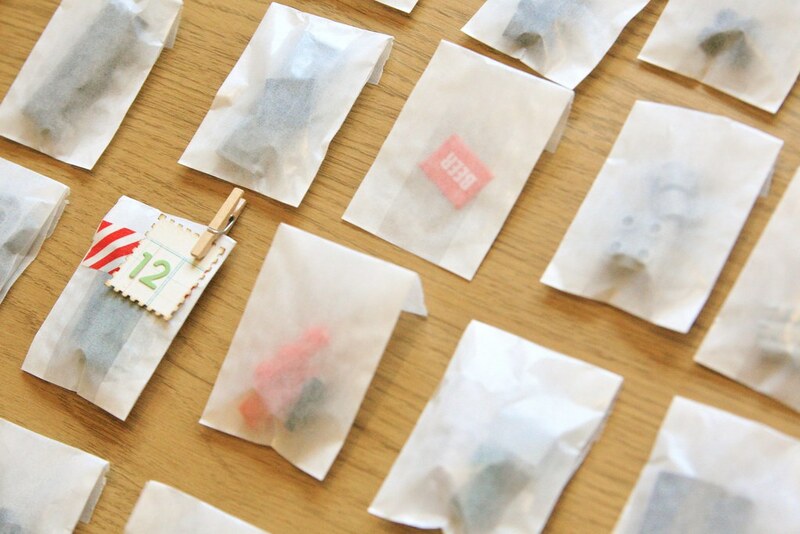 The advent calendar is made up of 24 little glassine bags, each big enough to hold a brick or two, and all available for a couple of pounds on eBay. I also acquired a bag of 50 mini pegs for the same price. 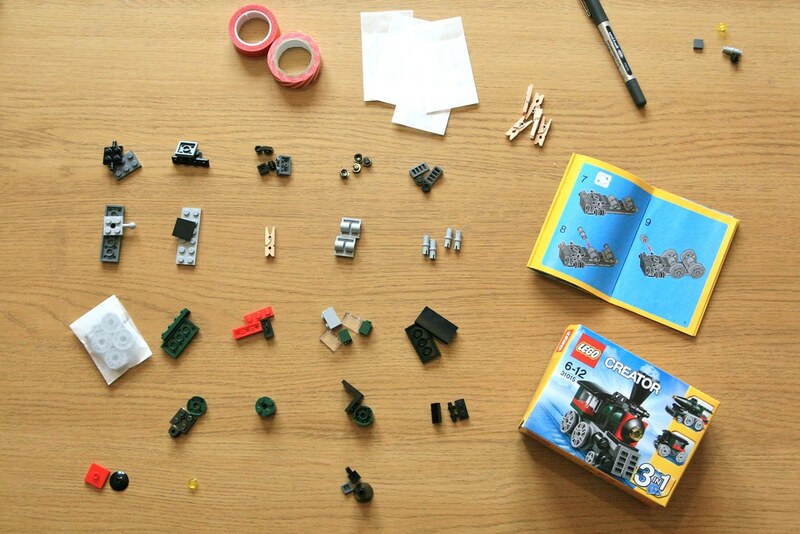 I popped the day's Lego into the little pocket and sealed it with washi tape from my stash. 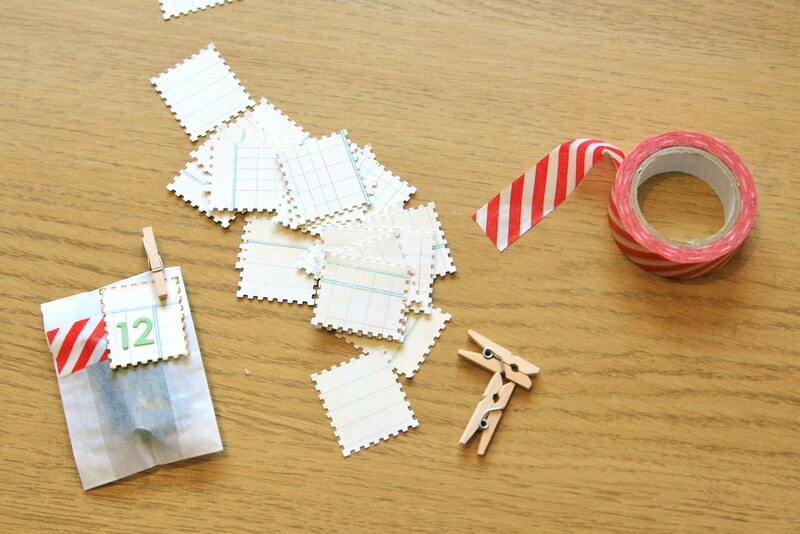 I used a punch to make a label from scraps of paper, added little number stickers for the date, and secured the label and the day's instructions to the bag with the peg. No glue, no stickiness, no mess. Quick, easy and pretty effective, if I say so myself. Repeat 24 times, with two cups of tea and a bit of Christmas music to get you in the spirit. I found organising everything in a grid made it easy for me to keep track of which bits of Lego went in which pocket and with which instructions. 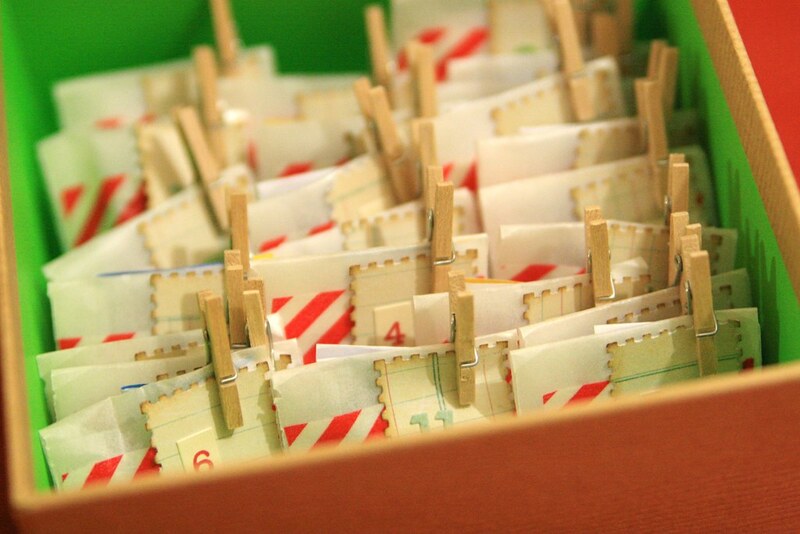 I found a box with a lovely green inside that I felt made a festive combination with the red washi tape, and stood all the little pockets up inside. I like the slightly haphazard look as it means you have to search for the right pocket to open for the day. I popped the lid on top, and presented it to the man, inviting him to guess what it was. It was definitely unexpected, and I hope he has as much fun opening it as I had making it. Because I want to do this every year! P.S. On the 25th, I'm giving him the full instruction booklet. These bricks can actually be assembled in three different ways to make different models. A nice hidden extra for when Christmas day arrives! Ooh, what a brilliant idea! My son had one of the Lego advent calendars last year and was less than impressed.....this is *definitely* an improvement on the Lego version...what a really great idea! 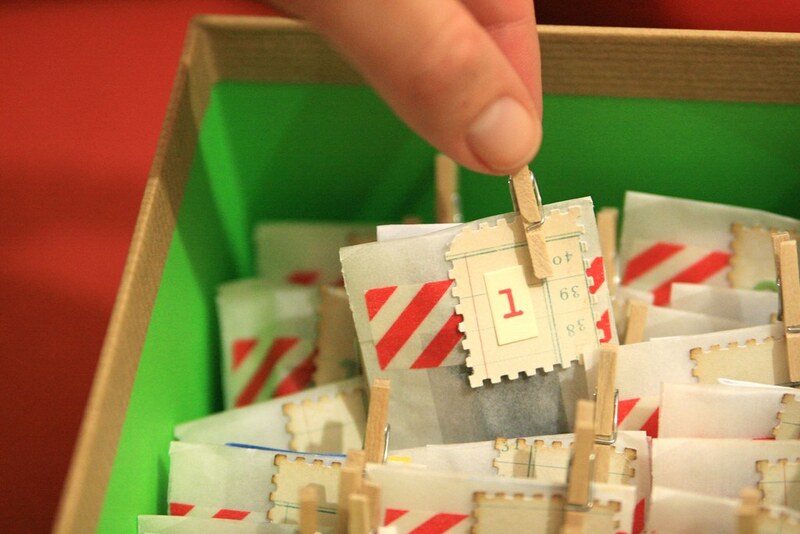 [I'd ben wondering what to stuff our homemade Advent calendar with....this is *just the ticket*!!! Thank you! Just brilliant! I am going to steal this idea for next Christmas! What a terrific idea ~ I hope he loves it! That is amazing! He is a lucky man. My mum takes a playmobil advent calendar into her class at school and they love it! This is so cute and a fantastic idea! I already had a calendar with little drawers in it but struggled the last few years with what to put in it. This year I'm trying a new idea where I put the name of a Christmas movie or book in each drawer and then take time out to watch or read that day's title. I'm excited to try it!